It is designed to meet the requirements and recommendations of the HSE, NHS and medical professionals. 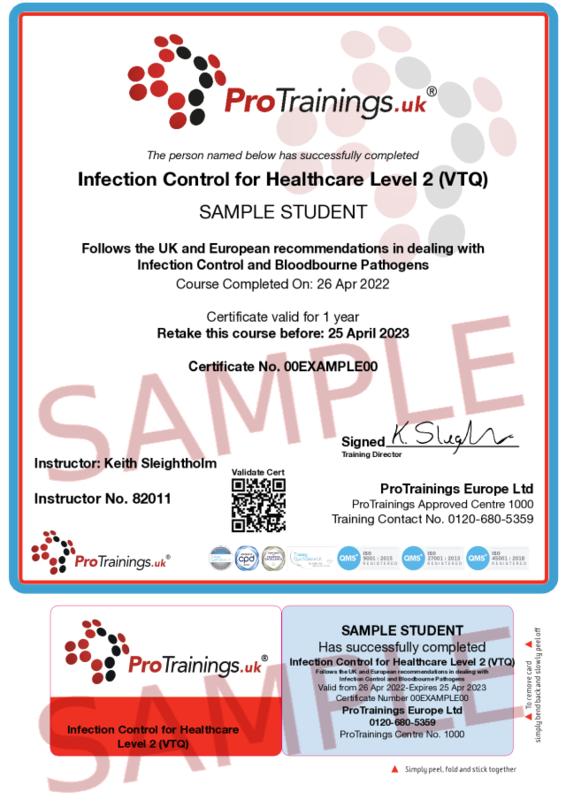 infection control training is required in other industries outside the medical world. This list is not the only workplaces where a risk is present. Anyone at any time could be at risk in their day to day life. This course comes with 3.0 hrs (4.0 class) of CPD, although the time to complete the course online may be less than this. Total course time includes 2 hours and 21 minutes of video training as well as knowledge reviews, final test, remedial help and reviewing downloaded material. LO 1.1 - Define what is meant by infection prevention and control. LO 2.2 - Explain the role of Public Health England in relation to infection control. LO 2.3 - Describe workplace policies and procedures to prevent the spread of infection. 3 Understanding the standard principles for preventing and controlling infection. LO 3.5 - Describe the chain of infection and how to implement it within the workplace. 4 Describe how to access advice and support. LO 4.1 - Identify the infection control lead within their organisation. LO 4.2 - Describe examples of when further advice should be obtained. Lo 4.3 - Explain what to do if they have any concerns relating to infection control. The Green Book has the latest information on vaccines and vaccination procedures, for vaccine preventable infectious diseases in the UK.